Charleston is about as far away from getting snow as I could imagine. A white Christmas is definitely not in store for those of us down here, as the weather forecast is predicting a sunny, 65 degrees on Christmas. To make up for our lack of flurries, I decided to make these black and white cookies because of their resemblance to snow-capped mountains. 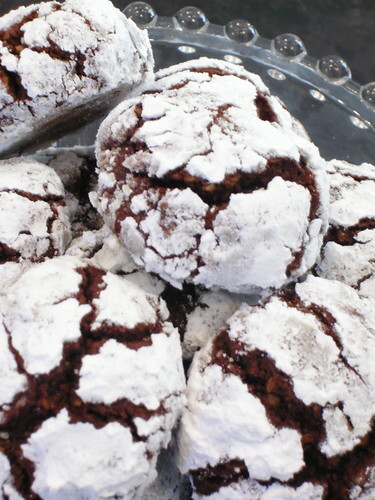 These cookies are very beautiful, with their powdery finish and deep, dark chocolate centers poking through. The nuts in the flour mixture add textural interest as well as a lovely toasty flavor. They would be more than perfect alongside a nice, steaming cup of hot chocolate, whether the weather calls for some or not. 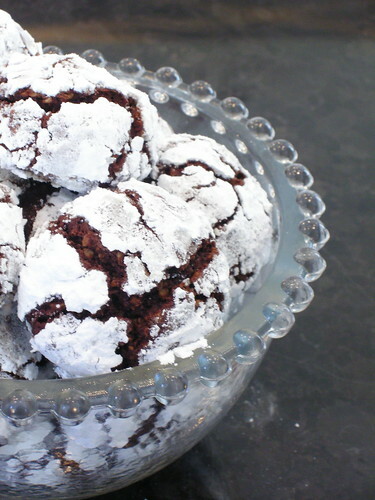 These cookies are especially nice because you can really make them ahead of time. The dough can remain unbaked in the fridge for a few days or in the freezer for a couple of months. Also, the cookies fare quite well in an airtight container for several days and can even be frozen, and later defrosted, once they have been baked. They are the perfect cookie for the baker with little time. In a bowl set over simmering water, melt chocolate and butter together with Cognac. Whip eggs with sugar until they form a ribbon, 5-7 minutes. Stir in melted chocolate. In a food processor, pulverize nuts with flour, then add baking powder. Stir ground nut mixture into chocolate batter. Chill chocolate cookie batter in refrigerator until firm. Preheat oven to 325 degrees. Line baking sheets with parchment paper. Roll cookie dough into 1-inch balls. First toss a few of the unbaked cookies into granulated sugar to coat, then roll in powdered sugar, coating completely. 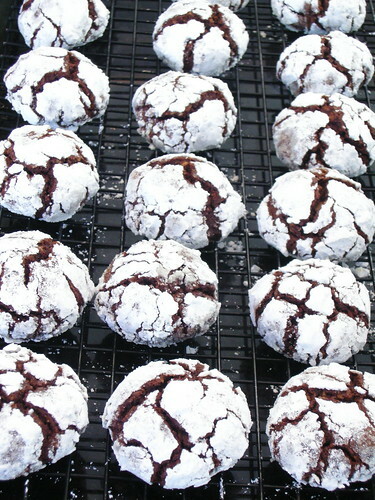 Set sugared cookies on baking sheet. continue to roll remaining cookies in both sugars. Bake for 12-14 minutes, rotating halfway through. Remove and let cool.